Explore Istria! You can do that from this ideal holiday home. Modernly furnished, comfortable bungalows. Cosy home that offers everything for a comfortable holiday. Air conditioning in the living room. 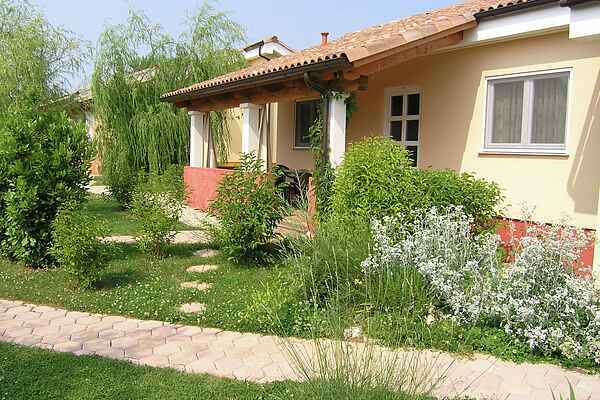 On a completely fenced terrain with gateway lies the small-scale bungalow park Lorena. Spread over the green and well-maintained garden are a total of 8 linked bungalows and a house with 2 apartments. Every bungalow has its own covered terrace with garden furniture, barbecue (on demand) and view of the garden. You also have access to a shared grill and lovely swimming pool. Groceries 200 m. The park lies 2 km from the historic center of Porec, and 2.5 km from the beach. A fun way to explore the rough inland is by mountain bike. Bike rental 2.5 km. Sports lovers can also go paragliding, water skiing, or rent their own (sailing) boat or jetski. Curious to what lives underwater? Then visit the aquarium. 55 km to the south of Porec lies the touristic Pula. You can't skip a visit to the amphitheater dating from the first century A.D. From Fazana (50 km) you can take the boat to the Brioni islands.